Very Good. 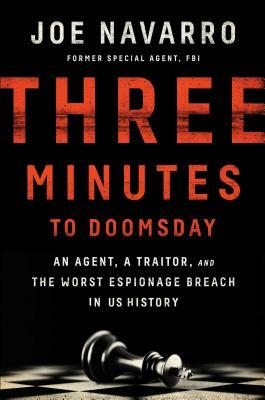 Three Minutes to Doomsday: An Agent, a Traitor, and the Worst Espionage Breach in U.S. History by Navarro, Joe, 2017-04-18. Sewn binding. Cloth over boards. 368 p. Contains: Illustrations. Like New. Book appears unread. Book is square, clean, and umarked, with crisp pages some highlighting All orders guaranteed and ship within 24 hours. Your purchase supports More Than Words, a nonprofit job training program for youth, empowering youth to take charge of their lives by taking charge of a business. Good. This is a hard cover book. It may have a minor bump or bruise. Minor cover or page wear/markings may be present as signs of previous use. Any additional materials( access codes/ CD, tables, charts, cards, letters, etc. ) are NOT promised to be included. Fast Shipping Monday through Friday-Safe and Secure! Please verify your shipping address at time of purchase to ensure delivery.